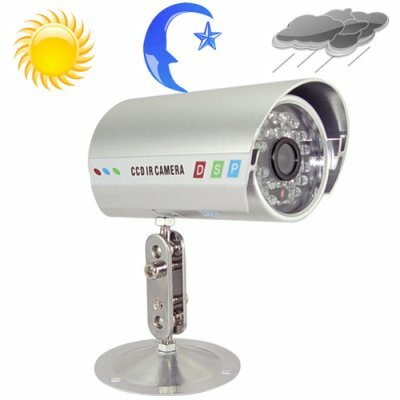 Successfully Added IR Video Security Camera - Color CCD Surveillance Camera (PAL) to your Shopping Cart. Night vision IR surveillance and security camera that provides maximum security for homes and businesses during the day or night. This professional CCD infrared surveillance camera is built with a high quality aluminum die-cast housing, 24 LED's to maximize night vision viewing at zero LUX, and has a 1/4 inch image sensor to give you a wide viewing angle. In today's society, security is a priority for any home or business. This nightvision security camera is specifically designed to minimize, deter and eliminate any thief or individuals seeking to cause any wrong-doing to your property. The self-adjusting iris on this digital infrared (IR) surveillance camera automatically adjusts itself in response to different lighting conditions, always making sure you get a crisp clear image, day or night. So rest assured, this high end security camera will let you clearly view what is going on around your premisis and provide you with a secure peace of mind. The CVHT-J09 is the answer to your everyday security and surveillance needs and is available to you straight from the leader in direct wholesale electronics, Chinavasion. Do I need a software to install this surveillance camera on my computer? Yes, but you will need a TV card for your computer, all TV cards come with their designated software. Thank you Chinavasion team for a great quality product.